Natural remedies for headaches include changing lifestyle habits that likely trigger an attack, as well as using herbs and supplements rather than over the counter pain medicine or prescription drugs. As with virtually all health problems, the more you can use natural remedies for headaches, the less it will cost you in time, money and unhealthy side effects. Most likely, 100% of medicine cabinets in America have non-prescription pain relievers such as Tylenol, aspirin, Excedrin, or Ibuprofen in them. One or more of these are the usual remedy of choice for those suffering from headache pain. This is not a big health concern if the headache is a rare occurrence, but if headaches are such a frequent problem that any of these over-the-counter medicines are taken on a daily or near-daily basis over an extended period of time, the risk of side effects greatly increases. These side effects include stomach and digestive problems, liver damage, respiratory and cardiovascular problems. When using natural remedies for headaches, unwanted side effects are normally fewer and less severe when they do occur. Another potential problem that comes with over use of pain relievers is rebound headaches. Rebound headaches happen when the body had built up a resistance to the drug so when it wears off the headache comes back, often even more intense than it was to begin with. Prescription drugs often used to control headache problems include barbiturates, tranquilizers and antidepressants, which have their own set of problems, including possible addiction. Associate Professor of Neurology at Johns Hopkins University details how to stop headaches naturally and get off pain medicine. His method has helped bring tremendous and sometimes complete relief to chronic headache/migraine sufferers. As shown in the chart above, headaches are consistently second only to lower back pain in complaints of pain in adults. if neck pain is included in the numbers, which is often associated with and a likely cause of headaches, the number exceeds complaints of lower back pain. Migraine headaches- Migraines are the second most common type of headache with about 18% of the population suffering from them over their lifetime.The average intensity of the pain is second only to cluster headache. The pain from a migraine has been thought to be vascular, meaning it involves the arteries in the brain as they first constrict, then dilate, putting pressure on the nerves that cause pain. But researchers in 2008 found no evidence of artery constriction before a migraine. They did find a 300 percent increase in blood flow BEFORE the onsite of a migraine and normal circulation during the attack. These findings have researchers thinking the discomfort of a migraine may have a cause other than arterial constriction/dilation. However, some factors appear to be constant. First, there is an increase of blood flow. As observed in the study above, before the onset of symptoms, or as originally thought, during the migraine with artery dilation. Second, the treatment for the pain, be it pharmaceutical drugs or natural remedies for headaches like ones I discuss below, all work by having an anti-inflammatory effect, Causing vasoconstriction (constricting of arteries) which indicates Vasodilation (artery dilation) played a role in the headache. (Even when not observed during the symptoms. )The thought is that migraine sufferers might be more sensitive to the slight dilation than non-migraine sufferers. Serotonin levels are frequently low and cortisol level are commonly high during a migraine attack showing a correlation with hormone imbalance. The migraine pain is usually on one side of the head and often, but not always preceded by a visual aura of seeing flashing lights or wavy lines. It can also affect speech and cause tingling or dizziness among other things. 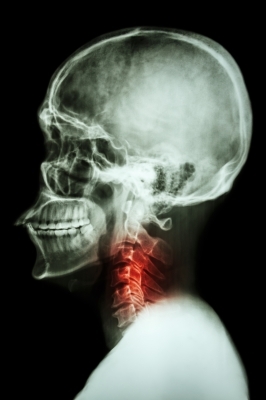 Avoid Poor posture - If you keep your head and shoulders leaning forward or backward for too long, as many people do when sitting doing work at a computer, it causes more weight for your cervical vertebrae (seen to the left) to sustain. This causes your back and neck muscles tighten, putting pressure on your occiputal nerves, causing the pain of a tension headache. Keeping your head and shoulders in an upright vertical position keeps the stress off your neck and shoulders. Avoid Junk Food - The more processed a food is, the more 'junk' is added to it that will harm your body. Some of the worst additives for headaches are MSG and artificial sweeteners like aspartame. Preservatives such as nitrates and nitrites found in processed meats are another trigger for headaches, as are color and flavoring additives. Avoid foods with Tyramine - Tyramine is an amino acid produced in aged food that acts like adrenaline and causes headaches in some people. Many cheeses, processed meats and fermented foods have lots of Tyramines. Avoid a spike or drop in your blood sugar level - Eating sweet foods with a lot of added sugar will first cause your blood glucose level to rise, then drop drastically when insulin is secreted from the pancreas to reduce the amount of sugar in the blood. This can cause an adrenaline rush which causes blood vessels to spasm, creating headache pain.The same thing can happen when you fast or go too long on an empty stomach. Magnesium - Many migraine sufferers testify to the effectiveness of a magnesium supplement to relieve migraine symptoms. 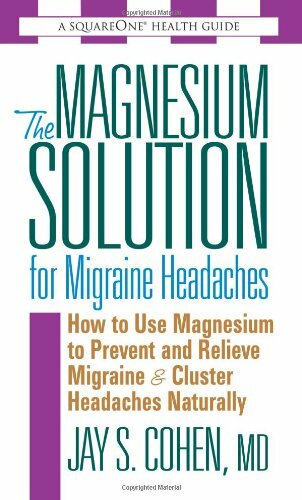 Studies also show evidence of magnesium on headache relief. Keep in mind when supplementing with magnesium that calcium, vitamin D and vitamin K2 all work Synergistically with magnesium in the body so it is important to maintain a healthy balance of them all for optimal metabolism and absorbtion. Riboflavin - A 2004 study showed migraineurs could reduce by half, the number of attacks they suffered by taking 400mg of vitamin B2, (Riboflavin) once a day. Although the duration and severity was not lessened. Riboflavin helps the body produce energy at the cellular level within the mitochondria. When the production of energy in the mitochondria of a cell is impaired, it is believed to contribute to headaches. Vitamin B2 helps convert tryptophan into niacin (vitamin B3). It also aids in the metabolism of vitamins B6 and B9. Riboflavin helps maintain the detoxifier, glutathione as well. B2 has a reputation of being one of the top natural remedies for headaches. Omega 3 fatty acids -There is plenty of evidence for the health benefits of Omega3s. They help the brain, heart, joints, bones, lungs and digestive system.This study shows the anti-inflammatory effects of omega3s also help reduce the amount, duration and severity of migraines. Fresh wild ALASKAN salmon and fish oil. Peppermint- Peppermint is a good source of vitamin C, which has anti-inflammatory and antioxidant properties. It also has rosmarinic acid, another antioxidant which helps block compounds that promote inflammation like leukotrienes. Many people find headache relief by rubbing peppermint oil on their forehead or sipping peppermint tea. Lavender oil - Studies show this anti-inflammatory herb has over 70% effective rate when users applied it under their nose, making it one of the top natural headache remedies. Don't consume lavender oil orally, but steeping the leaves in boiling water and drinking as a tea is an effective way to use lavender for headache relief. Basil - Basil is a common ingredient in many Italian recipes but it is also has many muscle relaxing properties, it has a significant amount of B vitamins, Vitamin c, calcium, magnesium and potassium, all which help reduce the pain of a headache. The oils in basil have a compound that blocks an enzyme which promotes inflammation. Its the same enzyme that over the counter pain medicines block. Those with a history of seizures are cautioned to avoid basil. Basil oil can be combined with lavender, and peppermint oils and rubbed on your forehead for pain relief. You can also drink basil as a tea by putting the leaves in boiling water. Ginger - Ginger is a well known digestive aid, but it also has anti-inflammatory properties and blocks prostiglandins that cause inflammation. You can boil fresh ginger root and drink as tea, or grind ginger root in smoothies. Ginger oil can be massaged on your forehead or just inhaled for pain relief. Get enough sleep - A 2010 study shows a lack of sleep, under six hours, creates proteins in the brain that cause headaches. Other reseach shows too mch sleep can also cause headaches. Stay Hydrated - A lack of water in the blood stream can reduce the amount of blood circulating in the arteries, causing them to dilate to increase blood flow and bringing on headache pain. Get moderate exercise - This study Showed moderate exercise was as effective in reducing headaches as relaxation or certain pain medicine. Though high intensity exercise has been shown to increase the likelihood of headaches not only because it causes dehydration, but histamine are released during exercise that are pro-inflammatory.